ATELOPHOBIA HAS BEEN RELEASED AND A GROUP OF FANS HAVE DECIDED TO MAKE A REAL LIFE SEQUAL. THE GAMES BEGIN ONCE THE ENTIRE CAST AND DIRECTOR OF ATELOPHOBIA HAVE BEEN CAPTURED, THEY NOW MUST PLAY A NEW GAME OF LIFE AND DEATH. AFTER THE HORRIFIC ORDEAL AND THE LOSS OF HER FRIENDS, HEATHER IS FORCED TO RETURN TO HOTEL FEAR WHERE TRAVIS PREPARES FOR HIS NEXT VICTIMS, HEATHER MUST FIGHT ONCE AGAIN. 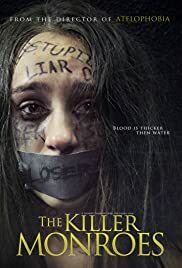 Stars: Eric Roberts, Tom Sizemore, Bill Oberst Jr.
Stars: Eric Roberts, Mindy Robinson, Bill Oberst Jr.
Heather and her best friend Morgan make the mistake of meeting up with friends at an abandoned haunted attraction. Inside the decrepit scarehouse, a cannibalistic monster lives, and stalks all those unlucky enough to enter his lair. Witness the tragedy that befall a group of 3 youths. Everyone knows the this years fighters in the Immortal Wars, But how did they get here? In these origin stories witness where our favorite deviants came from. Two U.S. ecologists travel to a remote town in South America to investigate what appears to be unnatural decay of the environment. They soon discover the cause is a horrific curse that's been haunting the lands for centuries.